We are known as "the one with a view." If you want to stay in Ohio's Amish country, for one night or a weekend getaway. Give us a call, we are perfect for a romantic Ohio getaway, anniversary or honeymoon. 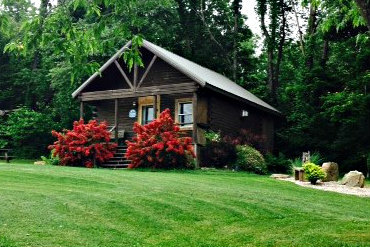 Sunset Ridge Log Cabins is simply the best in Ohio area Lodging when you want quiet relaxation and beautiful views of the countryside. 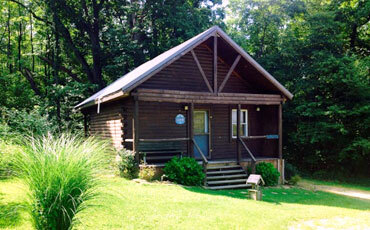 We think you'll love staying atop Sunset Ridge in a log cabin! Read some of our testimonials and see what other couples had to say about their stays. Our cabins are cozy, clean, comfortable and fully equipped for your stay with all the amenities and atmosphere you're looking for to get away and relax, reflect and renew. Come and catch your breath taking view. We are here to celebrate our 33rd anniversary and we sure enjoyed it. this place is so peaceful and a calm to our souls. Thank you for creating such a wonderful place to get away. The sunsets and stars were amazing and the hot tub soothing. We'll be back! This has been the most amazing weekend of our lives. the cabin was the best gift that my boyfriend had for his birthday. the hot tub is amazing and so relaxing. We took a chance with this adventure but it has brought us closer than ever. Thanks so much, we will be back for another amazing weekend. This cabin was perfect for a relaxing weekend away. It is cute and cozy and a great size for just two people. We enjoyed sitting on the back porch and listening to the silence. We will definitely be back! Awesome cabin & amazing views! Honey run Falls amazing too! Spent two nights here for some alone time and celebrating our second wedding anniversary. Really enjoyed the quiet area and sitting by the fire. My favorite part was the drive to Millersburg Amish Country. Seeing all the people working outside and the children playing was beautiful. -- Mike & Lisa from Grove City, Ohio.